I’m dusting off this ol’ website to announce that, today, my fifth book has been published. It’s called Sass For Web Designers and has a familiar pink cover. The book is the 10th release from the wonderful folks at A Book Apart. They are the best team an author could hope to work with, and I was honored to follow up CSS3 For Web Designers with a book about Sass (something I was reluctant to embrace for years). 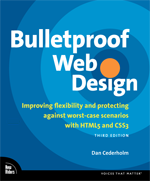 And that’s why I wanted to write this book: To convince other folks like me out there that Sass can make their lives easier and more efficient when it comes to creating websites. I thank Dribbble Co-Founder, Rich Thornett, for being relentless in advocating Sass’ benefits while I resisted for probably about a year. Once I discovered that I didn’t need to learn complex programming or command line shenanigans, and that it didn’t need to immediately change my workflow or interrupt the way I’ve been writing CSS for a decade, well then I was hooked. Using Sass doesn’t mean having to learn Sass in its entirety. You can start small, and slowly add more of Sass’ capabilities over time—even on large, complex, legacy stylesheets. It’s what I’ve been doing with Dribbble’s CSS for a long time now. Converting more and more of the stylesheet to Sass as needed, or as I have time to refactor things and/or learn more about what Sass can help with. You can start quickly and easily, then incrementally add more Sass power as you become more comfortable with it. Again, my primary goal for this little pink book is to simply get more people interested in using Sass to make their lives easier. Sass is a wonderfully helpful tool with a great community behind it, in a discipline that can be complicated and frustrating. I’m hoping you give Sass, and the book, a try! And now for a heaping pile of thank yous. To Jeffrey Zeldman, Jason Santa Maria, and Mandy Brown for creating a place that I genuinely want to write for. To Katel LeDu for being a fantastic project manager and steering things the entire way. This year has been particular rough for me personally, so it’s especially satisfying to see this thing actually released. To Erin Kissane for making me sound far better than I actually am. Thanks also to Jina Bolton for tech editing the book, as well as her work for the Sass community in general. To Chris Coyier for being smarter than all of us and agreeing to write a foreword. Also to Hampton Caitlin, Jenn Lukas, and Chris Eppstein for saying nice things about the book and letting us print those nice things on the inside cover (which Jason brilliantly selected to be Dribbble pink, naturally) among the other awesome things they do for the web. Like, I don’t know, creating Sass, building Sass, and generally being rad. This is my favorite website. I visit it almost every day. It’s not responsive. It’s not optimized for iPhone. It looks blurry on a Retina display. It doesn’t use the latest HTML5/CSS3 framework. It doesn’t have a thoughtful vertical rhythm. The fonts are nothing special. It is neither skeumorphic nor flat. It doesn’t have its own favicon. It doesn’t have a native app or Twitter or Instagram. It doesn’t use AJAX or SCRUM or node.js or Sinatra. It doesn’t have an API or an RSS feed or VC funding. It hasn’t been featured on a prominent tech blog or won an award. It tells me the soups of the day. Freely distributed information that’s relevant to the person reading it. That’s web design.